UCentric unlocks vital insights from data – your data on your own network that could be working harder to inform your business strategies and enhance operations. When connected to your operation’s multiple devices, it captures and analyses raw information, seeks out non-obvious relationships and produces reports to improve efficiency and your top line. 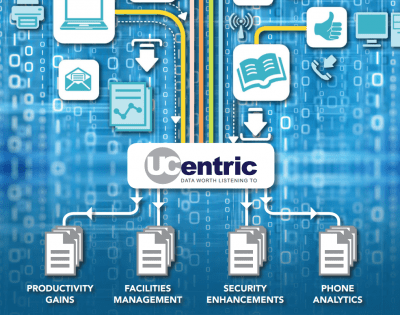 UCentric offers the next level in data analytics to all organisations in any sector or industry. UCentric’s capabilities allow it to leverage an organisation’s data to provide insightful and actionable reports across all sectors and industries. By making use of the most important data an organisation has – its own – UCentric offers a breakthrough in data analysis. If a device can produce data – from vending machines to temperature sensors; voice systems to network drives – UCentric can capture it, analyse and offer bespoke intelligence on the working practices of an organisation and inform future strategies. UCentric’s ability to embrace and leverage new technology which can add further data sources also makes it future-proof. For a single piece of data to offer value, it first needs to be collated, analysed and cross referenced to other information. It is the infinite range of devices which can be connected to UCentric which makes it unique – imagine the power of linking voice, unified communications and facilities data to guide management decisions. Ultimately, as long as a device can output digital information, UCentric can incorporate it in its analysis and reports. The data can be aggregated on a real-time basis at a building, portfolio and organisational level. UCentric unlocks vital insights from data – your data on your own network that could be working harder to inform your business strategies and enhance operations. When connected to your operations multiple devices, it captures and analyses raw information, seeks out non-obvious relationships and produces reports to improve efficiency and your top line. UCentric offers the next level in data analytics to all organisations in any sector or industry. UCentric has the potential to work for organisations in any sector or industry, including bespoke projects. To find out more ways UCentric can unlock the hidden gold in your organisation’s data, contact the MIT Dynamic team. For more information, or to arrange a demonstration – please complete the following form.